...but I did end up pretty much doing what I thought I would. Some housework, some reading, some TV and a bit of a nap. What I hadn't planned on doing when I got up this morning was going to the hardware store and spending quite a lot of money! It was however worth it because I have made myself some crafting space in the spare room! 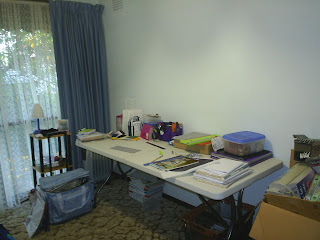 It's not really organised yet but it is at least off of the dining room table for the first time in months. It used to only get moved when we had visitors and even then it was just put in the corner! I also bought some vegetable seedlings, and we are going to have another go at killing them off. Over the weekend I will show you what my plants normally end up looking like! LOL! The fact that you attempt to grow things, makes you a braver person then me. :) I kill plants and fish, don't know why, just can't keep 'em alive. I would love to have a crafty area on my first floor. I to have to use our kitchen table and clean up afterwards. All my stuff is in our basement. So I have to make a few trips up and down to get ready to craft.